Transform your dull boring hair with CosmoHerbal’s exciting range of hair colors that offer shades in black, brown and burgundy. Completely ammonia-free, the hair therapy does wonders in evenly spreading the color and giving the texture a silky smooth finish. 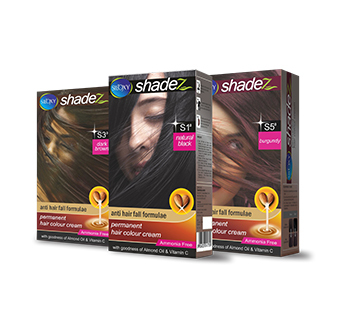 Go blonde, sport a burgundy or simply flaunt a natural black shine with Cosmo Herbal’s completely Ammonia free SHADEz Hair Color. The advanced hair color targets each strand of the hair, offering them a long-lasting and a sparkling shine. It also has an amazing blend of almond oil and protein that helps in retaining the moisture content in your hair.